“The future is already here – it’s just not evenly distributed,” goes the clichéd [William Gibson] quote. Growing up on all the Cyberpunk literature and spending a more-than-healthy amount of time obsessing over [Fred Gallagher’s] Megatokyo series, I always imagined Japan to be at the very tail of this distribution. The place where the Future lives. Though it has been decades since the Bubble burst, and there’s no way this could still be the case, there was something romantic about believing it just might be. Thus, I opted for keeping the dream alive and never actually visited the place. Not until a few weeks ago — [Bilke], one of our crazy sysadmin guys that keeps Hackaday.io alive, made me do it. He found these cheap tickets from LA, and the next thing you know – we were flying out for a 48-hours-in-Tokyo weekend. With no time to prepare, we reached out to [Akiba] from Freaklabs and [Emery] from Tokyo Hackerspace for some tips. By the time we landed, emails were waiting for us, with our full schedule completely worked out. It’s great to know that no matter where you are, there’s always a friendly local hacker willing to help. Past the immigration, we took the JR Narita Express line into to the City that Friday evening. From there we grabbed a taxi because we couldn’t understand a word in katakana but then we hopped the JR Yamanote Metro line once we had figured things out. We checked out all the major places we had ever heard of (Shinjuku, Shibuya, Roppongi, Ginza…) because the jet lag was not letting us sleep anyway. Hackaday alum and Dangerous Prototypes founder [Ian Lesnet] is in Japan and he’s been spending a lot of time at Akihabara Electric Town. For those that don’t recognize the name, this is an electronic components extravaganza with buildings packed full of small shops each specializing in different merchandise. 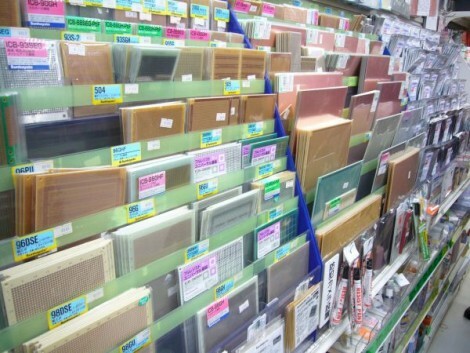 For instance, we love this picture of a shop that carries every kind of protoboard, breakout board, and copper clad sheet imaginable. The stall next door might have nothing but LEDs, or be full of cords for every purpose. We’ve been following [Ian’s] regular tweets about the trip. Luckily, he just posted a roundup of the Akihabara posts. Surprisingly, he restrained himself to purchasing just a few items. Part of this is a limit on the amount of stuff he can get back to the States with him. The other reason is that the prices are not necessarily less than you’d find in a catalog. He mentions that the nice thing is you can see the parts before buying them. This is useful for sizing knobs, transformers, cases, etc. The most exciting thing in his bag is a half-dozen nixie-like VFD tubes for just $12. How much would you give to have this shopping attraction down the street from you? If you’re interested in a video tour of Akihabara check out this one from the Tokyo Hackerspace.